The modern society is both funny and sad in very many ways. We were conceived by our parents and raised by them until we started working and eventually brought up our own children. However, there comes a time when our parents grow old and can no longer take care of themselves. In such case, we are obliged to look after our parents, something called “parenting our parents.” Our aged parents have no one to turn to and their children, who are also adults with their own responsibilities, are required to help them age well. There is no specific age or benchmark age that one can term as the onset of old age. This is because people age differently. With age, so many things can start to take place, and the state of an individual during their old age varies based on the conditions they were subjected to during their younger years. Most of these living conditions eventually affect the health of the people in one way or another. Some older adults have lived healthy lives and have aged gracefully. Others may have been smokers or drinkers all of their lives and have started aging prematurely. Yet others may have had difficult, stressful lives and have a series of health conditions as a result. Every senior's situation is different, so every senior needs to be considered on a case by case basis. So the big question is, when do seniors need adult day care services? Well, this question has no definite answer since life is not a definite thing. Each and every senior out there lives an entirely unique life. All the conditions they are subjected to are very different and therefore there is no definite way to say when seniors need adult day care. However, there are some general ways that one can look at and use them as a guide to dealing with their loved ones. How do I find adult day care near me? There may be many adult day care centers near you because of the large number of adult day care facilities in general, and if you've decided that your loved one needs to be in an adult day care, you should concentrate on finding a facility that suits your needs. When looking for an adult day care center nearby, consider your requirements that include the health conditions, financial aspects and geographical location among others. How far or close to the center of the city / town is the adult daycare? Adult day care centers can vary significantly in price depending on the number of services and the types of entertainment offered. The average nationwide cost for adult day care in the U.S. is just a little over $1500 per month. Adult day care centers are generally facilities where seniors do not live, instead they stay in the adult day care center during the day to receive various types of services such as food, fun activities, as well as nursing care. Adult day care services generally include a nurse on staff to take care of the people there, to check blood pressure and other essential vitals to make sure that seniors staying in the facility don't have any health issues throughout the day. Traditionally, adult day care centers have been used for short-term rehabilitation, such as after a senior spent time at a hospital. These centers are also good for those seniors who don't want to or have no need to be in long-term care facilities such as assisted living facilities or nursing homes. Adult day care centers are also often used by seniors with Alzheimer's or Dementia. It is no secret that when people age, their health deteriorates in one way or another. Even the old people who led lives that were drug-free and full of healthy living choices experience weaker immune system as old age sets in. Some health conditions associated with old people are new while some of them have been following these people from their younger days. Adult Day Care does not involve any housing services, unlike assisted living that provides 24/7 housing as well as care for older adults. Adult daycare centers only provide care and entertainment for seniors during the day. Assisted Living is generally recommended when older adults cannot complete at least two daily living tasks such as dressing, bathing or eating by themselves, while adult day care may be a good option for relatively independent seniors who don’t have anyone to care for and entertain them during the day but can otherwise spend their nights at home with their loved ones. Home health care is a flexible care option for adults that can be used in conjunction with or instead of adult day care. Home health care agencies can be contracted for a couple of hours per day or for 24/7 live-in home health aides to help provide care for your loved one. As compared to adult day care, home health care aides cannot provide any of the recreational opportunities available in adult day care centers. In addition, adult daycare facilities provide dining options while a home health aide may or may not know how to cook well enough to please your loved one. When do seniors need adult day care? Senior adult day care should be considered whenever old age sets in and the senior doesn't have anyone to care for them at home during the day. In such a case, looking for local adult day care options or looking for local home health care agencies will be a good choice. As we mentioned before, old age is very relative since some people lead very active lives and you can find them still energetic and lively in their late sixties, seventies or even eighties and beyond. Some seniors have a weakness of being conservative and rigid which makes them very reluctant to change their lifestyles. 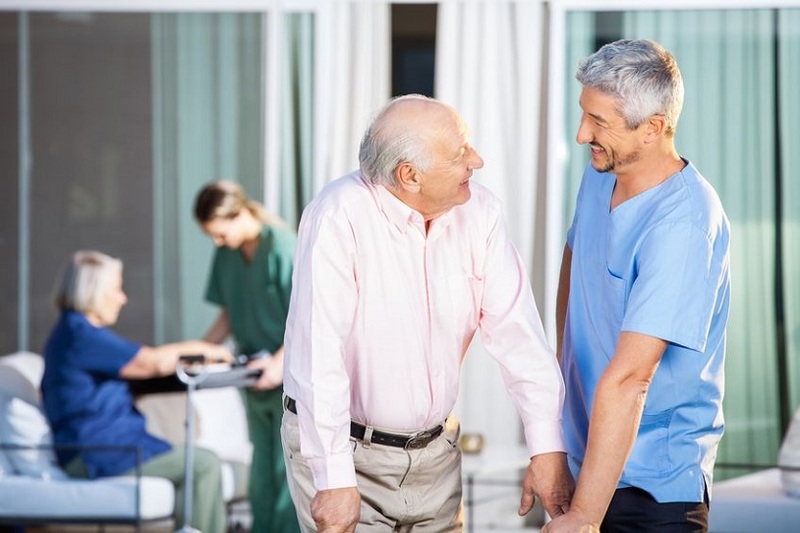 However, it is paramount for them to clearly understand that people have responsibilities to take care of and that adult day care or a senior living facility, at one point or another, may be the best option for them to receive adequate care. Most health care professionals have reported that this conversation is dreaded by many since the reception is not always good. Senior citizens are sensitive, and they may start getting ideas that you want to do away with them or have similar types of thoughts. Well, adult day care is good for both the older individual and the person who has been taking care of them, since it allows grown children to go about their day to day activities without worrying about the safety of their parents while they are away. One sign that a senior needs adult day care is when they start feeling “tired” and start having trouble taking care of themselves. Older people cannot remain active forever, and once one’s energy starts decreasing, and there is no loved one to take care of the senior, you should not wait for any other sign for you to start considering adult day care. We are aware that there are some seniors who are very active and can wake up, make their food, clean their yard, drive to the mall and even go and play golf and will not complain about their back aching in the evening. On the other hand, some seniors will not be able to do any of the aforementioned activities and will be aching all over in the evening regardless of what they did during the day. These are some of the signs that you may want to consider adult day care. Mental health is a critical part of this discussion. Life is all about decisions, and we are faced with choices each and every moment. The soundness of these decisions is based upon the mental stability of the senior. It is quite common to see some older people with declining mental health as age advances. Their physical condition might be perfect, but their mental state, whether it is dementia, Alzheimer's or simply senility, makes them quite vulnerable. This is another sign that your loved one may need to be taken to an adult day care facility during the day. Such people need to be under controlled environments where their decisions can be monitored and corrected whenever they are erratic. It has also been studied and concluded that memory fades a lot when an individual lives alone, and taking them to adult daycare might help that. Aside from that, the professionals at the adult day care are experienced in dealing with problems associated with old age. They can recommend the best dietary plans that help seniors improve their condition over time. The social aspect of seniors is also a factor that needs to be put into consideration. It is very common to see senior citizens become unusually aggressive and antisocial. This can be attributed to loneliness, or it can be a result of chronic pain. Chronic pain can cause great aggravation to seniors as it's something that, in many cases, cannot be controlled well. When such signs set in, you also need to start considering adult day care as an option. At the adult day care center, many activities keep seniors busy, and the interaction between other seniors in that place is very beneficial to everyone involved. These are some of the reasons that might prompt you to send your loved ones to an adult day care center. All the same time, adult day care is generally good for older people. Even if your loved one seems well and healthy, taking them to an adult day care while you are away will help them live well and socialize well with other people their age. The transition from being an adult to a senior is very hard since it involves very significant tweaks in one’s lifestyle. All the activities taking place at the day care are very helpful to seniors, and senior citizens need them for seniors to live longer.